Four Days in Paris, Day Three! The Paris in my mind was different from the Paris my daughter and I met. I saw crowded streets full of students and artists bustling around town, a baguette lodged under their arm, a beret perhaps, lots of beautiful women in vintage dresses, somehow music playing softly somewhere, fast little cars zipping around … a rat as a chef… no, of course, I’m describing the Paris in movies. The Paris in movies is not the real Paris, just like the Italy in movies is not the real Italy. If you’re traveling to popular destinations during August you have to prepare for two things. The first is that the locals will have vacated — this is true of most cities in Italy and it is most certainly true of Paris. Those frogs—er, French people—vanish for the seaside because, you know, they can. And so what’s left? Tourists, tourists, tourists, and more tourists. What do the remaining Parisians do? They jack up the prices, yo. It’s like being dropped into the middle of Disneyland for a few days. This is only sort of true. You CAN find cheap places and by cheap places I mean, they are about, on average, double what you pay in LA. When Emma and I had our morning cup of coffee – we had two croissants, cafe au lait for me and a hot chocolate for her. That ended up being 10 Euro. But ten Euros is like $15. So that’s an expensive (cheap) breakfast in LA. That’s like going to Whole Foods and getting the same. The thing about French people too is that they seem to relish taking advantage of dumb Americans. They can tell you whatever the hell they want and they know you’ll be too embarrassed to argue, which I was, which is how I ended up flat busted by the end of our four days in Paris. Tourists be warned — there are going to be things you don’t understand — if I’d had it in me I would have mustered up my courage and asked directly, what’s this extra charge on my bill if it’s not the tip, for god’ssakes? If you can do it in French all the better — but if you aren’t fluent in French you’re kind of screwed lest you want to be obnoxious and argue. We’d lucked out so far. The first dinner we had was at a local bistro with only French people eating there. We couldn’t read the menu but we pointed to something that looked good. Emma had trouble chewing a bite of her steak, however, and chewed that sucker for around ten minutes. She asked if she could spit it out and I said, “CHEW IT AND SWALLOW IT!” So she took a sip of water, chewed, took another sip of water, chewed, and chewed, and chewed, and chewed, and chewed. Finally, the blasted thing made its way down. After that I switched plates with her because she’d gotten just a tougher cut. I think we both sweared off red meat after that. Thirty Euros total, including wine and bread. A great deal (even though that’s like $45). The second night we had the best dinner of the trip. I had a whole fish, Emma had salmon – great company, incredible food, Emma had creme brulee and a cheese plate to finish it off. $60 Euros. That one hurt. That’s like $75 or something, maybe $80. We just don’t pay that kind of money for dinner. Ever. Our money, needless to say, was dwindling. We’d bought a two-day boat shuttle, which turned out to be a pretty good deal because you can hop on, hop off anywhere up the Seine. We took full advantage because when we were tired out we’d simply hop back on the shuttle boat and sit for about an hour as it made its stops up and down the Seine. Day Three meant we had to go to the Louvre. We’d been avoiding it thus far for many reasons. I personally wanted to skip it. Emma only really liked modern art at this point, we’d been to the Musee d’Orsay, which is incredible. But if you go to Paris you have to go to the Louvre, right? Still, Emma didn’t want to go. Oh, the other problem was that this was Monday and the Louvre was closed on Tuesday, as were a lot of other museums – Tuesday was to be our last full day in Paris so we had to do the Louvre on Monday. We planned on it being our first stop but wouldn’t you know we got kind of sidetracked, as one often does in Paris. One does, doesn’t one? We also had plans of checking out the Latin Quarter for dinner (thinking, stupidly, that students hung out there so there had to be cheap eats). 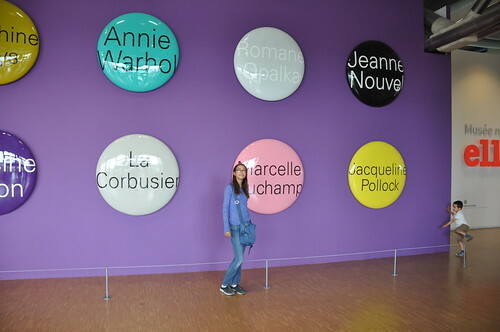 We meandered up a ways to the Pompidou. Emma had wanted to see what she thought was the “lip sculpture.” She went on and on about it — insisted that we go. Full disclosure: much of Emma’s desire to see Paris and goals while there was to fulfill a gamer-girl fantasy. She used to play (until she scratched the CD to hell) a Nancy Drew game called Danger by Design which apparently takes place in Paris. Most of her reference points had something to do with this silly game and I have a feeling that’s how the whole lip sculpture thing became such an obsession. Nonetheless and be that as it may, we were determined to find it. Kids are funny that way. They have no problem tossing their food and then asking for something else to eat a half hour later.¬† But poor Emma, I made her eat most of it. She’ll probably remember Paris for two things. 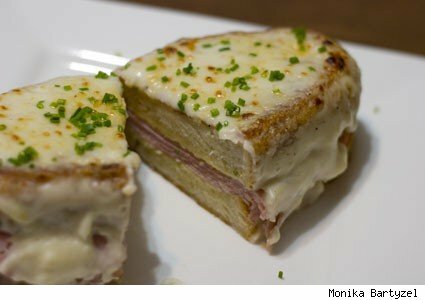 Being forced to chew that steak and having to choke down the Croque Monsieur. I knew that it had such a high calorie count it would easily hold us until dinner (do you know how often kids want to buy food?). Oh, and the lip sculpture. She’ll remember that too. Here is Emma choking it down. It was so filling and so rich neither of us could even think about food until late that night. This is, I’m convinced, why Parisians eat so late. They’re way too sick after eating lunch. 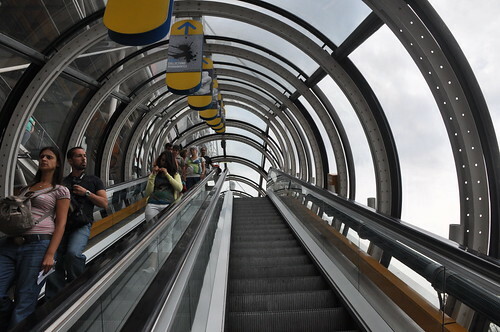 Then it was off to the Pompidou, one of the major highlights of our trips. My brother-in-law had suggested this museum, even though it isn’t on the list of must-sees (I also wanted to see the Picasso museum but I’ll have to catch that next time). 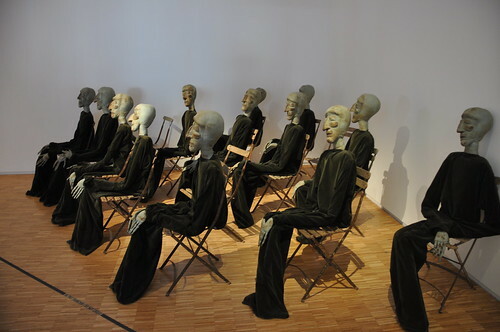 The Pompidou is a modern art extravaganza – full of great old Picasso paintings and the like. 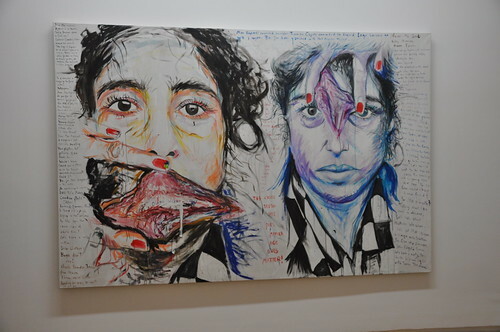 But the real draw was that they were having this exhibition on female artists called elles@centrepompidou and it is really the coolest thing – all female artists on display as a reaction to the idea that most of the world’s most famous museums are full of male artists. 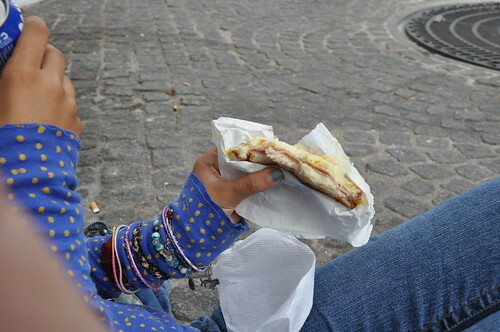 This, I thought, was the best lesson for Emma of the entire trip (even more than the whole “eat your goddamned Croque Monsieur – it costs a goddamned fortune!). 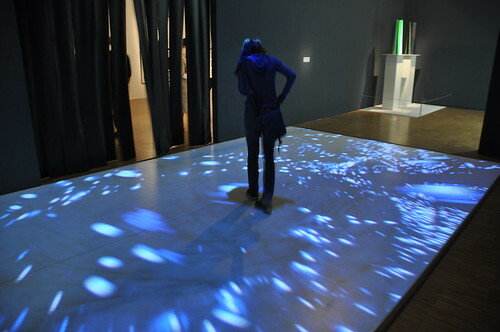 The exhibit opened with large buttons of male names morphed into female names. 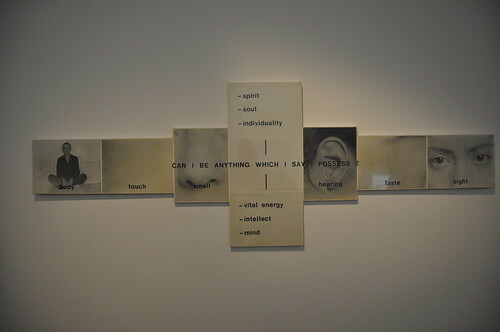 I really liked being able to explain to Emma about what it means to be a female artists. It was probably one of the high points of my entire experience as a mother. It means so much to me personally that women are able to connect with their artists within and express themselves. Yes, it just so happens that much of this is vaginal-oriented. Why is this – well when you think about it, it kind of is a big deal – this is where babies come from. This is the entrance and the exit. It is the worst curse word. I feel like Yoko Ono all of a sudden. ANYWAY — so, yeah, we had to deal with a lot of that but hey, we’re women, we can handle it. Listen, after childbirth anything is possible. 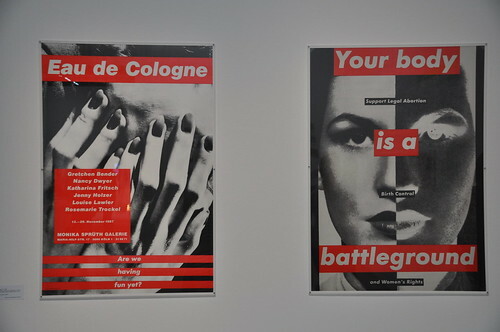 Much of the art was disturbing, some of it very funny, some of it sad — all of it provocative and interesting. No, perhaps women don’t lead the charge where movements are concerned — not yet anyway (although I think performance art kind of started and stopped with Laurie Anderson). 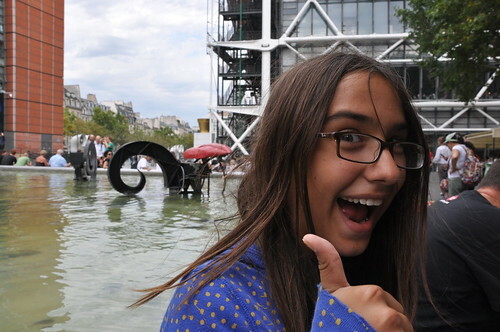 After the Centre Pompidou, we found the lip sculpture, at last, the lip sculpture! We hung around a bit and then we knew we had to get to the Louvre before closing time, which just a couple of hours away. We got ourselves back on the shuttle bus and rode it around for a while in order to rest ourselves. At some point it got us back around to the Louvre and we took our chances. By now, clouds had rolled in. Two bright cloudless days in Paris were coming to an end; we didn’t mind, though, Paris is somehow more lovely when it rains. Being from California, we don’t get rain much anyway so that in itself is exotic. Summer rain even more rare. It was all good. Saving Part Two for later because I’m all typed out.